At the height of the Vietnam War, American society was so severely fragmented that it seemed that Americans may never again share common concerns. The media and other commentators represented the impact of the war through a variety of rhetorical devices, most notably the emotionally charged metaphor of "the wound that will not heal." References in various contexts to veterans' attempts to find a "voice," and to bring the war "home" were also common. Gradually, an assured and resilient American self-image and powerful impressions of cultural collectivity transformed the Vietnam war into a device for maintaining national unity. Today, the war is portrayed as a healed wound, the once "silenced" veteran has found a voice, and the American home has accommodated the effects of Vietnam. The scar has healed, binding Americans into a union that denies the divisions, diversities, and differences exposed by the war. In this way, America is now "over" Vietnam. 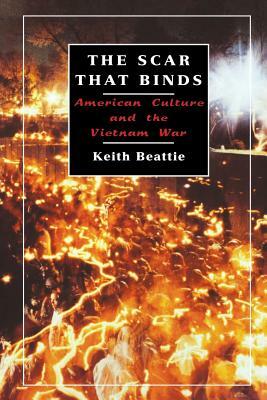 In The Scar That Binds, Keith Beattie examines the central metaphors of the Vietnam war and their manifestations in American culture and life. Blending history and cultural criticism in a lucid style, this provocative book discusses an ideology of unity that has emerged through widespread rhetorical and cultural references to the war. A critique of this ideology reveals three dominant themes structured in a range of texts: the "wound," "the voice" of the Vietnam veteran, and "home." The analysis of each theme draws on a range of sources, including film, memoir, poetry, written and oral history, journalism, and political speeches. In contrast to studies concerned with representations of the war as a combat experience, The Scar That Binds opens and examines an unexplored critical space through a focus on the effects of the Vietnam War on American culture. The result is a highly original and compelling interpretation of the development of an ideology of unity in our culture. Description: Ex-library copy with the usual stamps, stickers, etc. Binding is solid and text/interior is clean and free of marking of any kind.